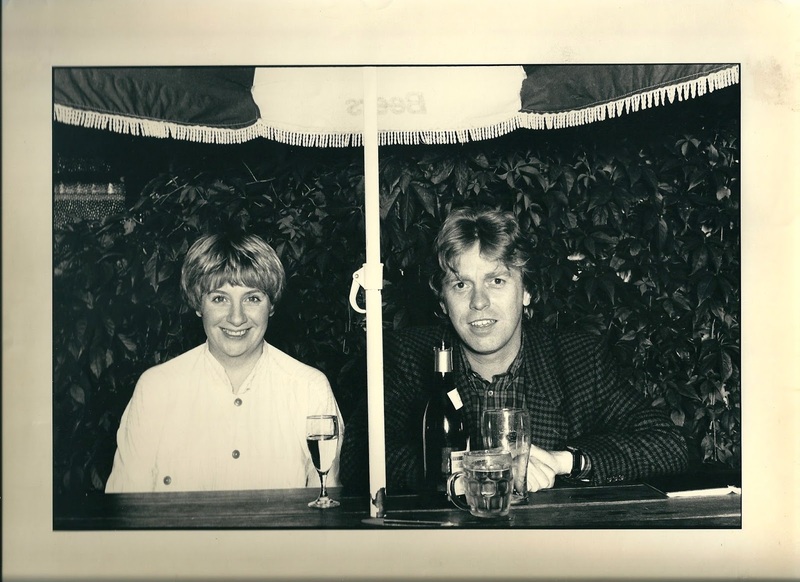 Ken Sharp took this picture of me and Victoria Wood. It was in the late 80s and we were talking in the garden of a pub in Salisbury after she'd played a show at the City Hall. I often mess up the "having a picture taken with the star" moment. It's not altogether surprising. You have one person who's utterly at home with having their picture taken. Then there's you, flushed and over-excited, your professional facade entirely lost. It wasn't a bit like that with Victoria Wood. She was happy to share whatever limelight was going. Lovely person. She was probably only too glad to give some of the limelight away. I used to sell books to her sometimes at Waterstones in Lancaster, and she was perfectly pleasant but clearly very keen not to draw attention to herself. Everything from the signature on her credit card (V. Wood in very small, very legible round letters) to the shades she was wearing when I once saw I her in the local Sainburys suggested someone who did not want to project a big personality when she was off duty. The shades rather backfired; I only noticed her because some other customers were saying to each other, 'Who's that in the sunglasses? Isn't it Victoria Wood?' I'm sure the life her talent brought her had its rewards, but 'celebrity' was not one of them. Victoria was well known then, but not yet the major star she became; she was very self-effacing and very chatty. She spent more time nattering to my wife, but I was with them for about ten minutes. I was intrigued to hear her say that although she was always nervous prior to her own live shows, she was even more nervous for Geoff, when he was on stage. At the time they toured regularly together, Geoff doing his Soprendo stuff for one half of the show and Victoria the second half. I haven’t ploughed through all the tributes, but it’s good to see the esteem in which she was held. Well deserved. One of our favourite efforts of hers is the TV film, “Pat & Margaret”. It features her usual crew: Duncan Preston, Celia Imrie, Thora Hird, Anne Reid and, of course, Julie Walters. She was a rare and major talent, as many of the tributes say, but better than that she seemed to be an all round decent lass. David: Idiot that I am, I think I might have offered this to the BHS comment. Fell over my fingers. Nobody knows anything. Didn't then. Still don't.